The lyrics to Danny Boy were written by Fred E. Weatherly while the music is taken from an old Irish Folk song called Londonderry Air. With so many versions along with variations and subtleties to the song, we have opted for an instrumental version by Eric Clapton. For the practicing guitarist, it's probably one of the easiest versions to play along with... and perhaps one of the best. This song is performed as an instrumental. You will need to know this song to be able to play it, as there are no lyrics in the music video to guide you. There are many versions available on YouTube for you to listen to. A hyphen separating 2 chords means there are 2 counts for each chord, e.g., A - Asus2 means 2 beat counts on A and 2 beat counts on Asus2. I have only done this for chords at the end of a line, as the chords within the song are correctly placed directly above the lyrics where the changes occur. The song is originally in the format of Verse 1 - Chorus 1 - Verse 2 - Chorus 2. Eric adds an extra Chorus at the end followed by a repeat of the last line. You will see all this on the song sheet, as the lyrics are included. Bm(maj7) is the symbol for a B minor major 7th chord. It can also be written as, Bm+7, Bmmaj7, Bmin(maj7), B-(maj7), or BmM7. The chord formula is 1 - ♭3 - 5 - 7. You don't have to play this chord, but it does add some interest to the arrangement. The Dsus4 and Asus4 can be interchanged with Dsus2 and Asus2 - they both sound good. Capo: Whenever you are using a capo, remember that it becomes your new Nut. Make sure you count the frets upwards from the capo when reading the charts. Visit the guitar chords page for help with any chords. This is a great opportunity to play along with one of the best guitarists in the world. He plays the song beautifully. If you find this arrangement a little hard or even a little confusing, I have included a simplified version . It won't sound quite right with the video, and it is in the original format of 2 verses and 2 choruses. 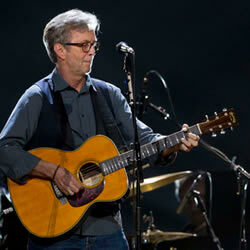 ERIC CLAPTON chords and lyrics are property and copyright of their owners. "Danny Boy" chords and lyrics are provided for educational purposes and personal use only.